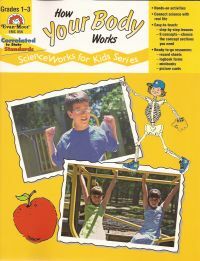 bones support and help move the body, muscles help the body move. Areas of study address major themes such as: change, structure, function, diversity, and cause and effect. Samples of the hands-on learning experiences: conduct blindfolded taste, smell, and hearing tests, count and record heartbeat during various activities, put together a skeleton puzzle, do an experiment to understand how respiration works. Illustrated throughout with fun, yet accurate line art.